Monday 5 October 2015, 6.30pm arrival for 7pm start. For more information on ward forum meeting see Lower Valley Forum or contact Mags Bryson, Lower Valley Neighbourhood Co-ordinator, Calderdale Council on 01422 288017. This entry was posted in Get Involved / Have Your Say, Oct, Rastrick and tagged Calderdale Council, Rastrick, West Yorkshire Police. A wonderful week of laughter and fun coming your way! 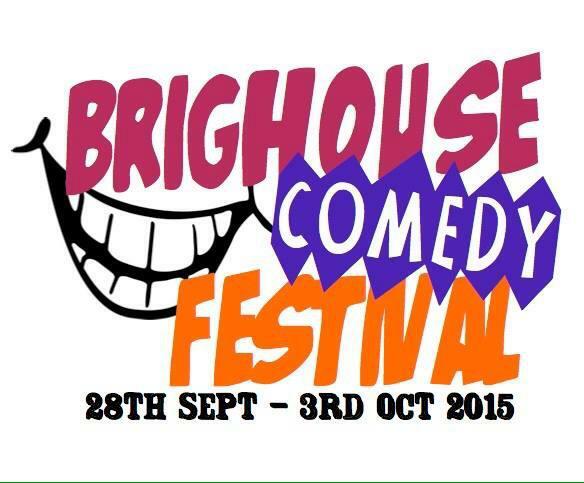 Get ready for a wonderful week of laughter and fun at the Brighouse Comedy Festival from Monday 28 September to Saturday 3 October 2015. We are madly working away to bring you some fantastic fun and laughter and will announce our line up in due course, we can tell you that there will be open mike nights, evenings of comedy entertainers, workshops and much more. If you would like to perform at the Comedy Festival please get in touch as we’d love to hear from you. I’m afraid we can’t offer any payment however this is a great opportunity for you to showcase your talents in front of an appreciative audience. The Brighouse Comedy Festival is organised by the Brighouse Business Initiative, we are a group of retailers who get together for fun packed meetings and to organise events in Brighouse Town Centre to encourage you good folks to visit Brighouse. This entry was posted in Oct, Sep and tagged Brighouse Business Initiative, Brighouse Comedy Festival. We’ve lots going on from September at Lower Valley Children’s Centres including fun activities like Messy Monkeys, Rhyme and Reading, Tiny Treasures, Saturday Splat!! And information and support clinics: Baby clinic, Health visitor clinic, Antenatal, Postnatal support and Childminder group and Family group. Alternatively complete a booking form and hand in at your nearest Children’s Centre. This entry was posted in Brighouse, Dec, Elland, Greetland & Stainland, Hipperholme & Lightcliffe, Nov, Oct, Sep and tagged NHP Sure Start Children’s Centre. The walk to Elland Back 2015 is a challenging 20 mile circular route to walk or run on Sunday 4 October 2015. There are regular checkpoints, spectacular countryside views and hot food at the end. This event is organaised and run by Elland Round Table volunteers. Yes, we can usually accommodate entries on the day, but please try to register in advanceso we can include you in our catering arrangements. Where can I see the route and photos? We’ve put a route map online and have an online gallery showcasing the stunning scenery you’ll get to enjoy. Where is the new venue? Yes, we do allow runners to take part, but we do ask that you adhere to the later start time so we can make sure the checkpoints are manned in time. How do I get further information about the event or Round Table? This entry was posted in Elland, Get Involved / Have Your Say, Greetland & Stainland, Oct and tagged Elland Round Table. We are holding one of our regular Table Top Sales at Southgate Methodist Church, Elland on Saturday 17 October 2015. Tables are now available to book from £10. Admission is 70p on the day which includes a cup of tea or coffee. All proceeds go to our Boys Brigade funds. This entry was posted in Elland, Get Involved / Have Your Say, Oct and tagged 5th Halifax Boys Brigade, Southgate Methodist Church. Sector Support Calderdale is hosting a FREE full –day event for voluntary and community groups, charities and social enterprises working in Calderdale. There will also be a series of presentations and two workshops, the workshops are free to attend and bookings for these will be taken on the day at registration. We are also holding an open funding panel in the morning, this consists of a selection of funders sitting on a panel in the market place and will give you the opportunity to ask those all important questions. where you can book a place online. If you do not have access to the internet please call the office on 01422 345174 and you can book a place over the phone. Please let us know if you have any specific dietary or access requirements when you book . Lunch and refreshments will be provided throughout the day and the entire event is free of charge. This entry was posted in Brighouse, Elland, Get Involved / Have Your Say, Greetland & Stainland, Hipperholme & Lightcliffe, Oct and tagged Sector Support Calderdale.